Jackie Macadam examines the second set of new projects adopted by the Church of Scotland Guild in a three-year partnership. 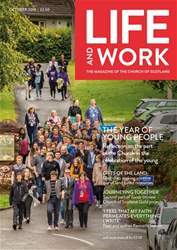 LAST month Life and Work featured some of the Church of Scotland Guild projects with an emphasis on the overseas projects adopted as part of a three-year partnership. This month the focus moves to the three home-based projects selected for partnership with the Guild over the next three years. Guild National Convener, Patricia Robertson, said: “Choosing the Guild’s Projects for a three-year strategy is one of the most interesting, exciting and challenging decisions we need to make. “It means choosing six from around 30-40 applicants, all of whom are doing great work. “We get enquiries and proposals from large organisations and from small ones.